Don't let the fennel season go by without trying this recipe. It was developed by Lisl Wagner-Bacher, who is the chef/owner of Landhaus Bacher in Mautern, Austria (in the Wachau). The recipe comes from her cookbook, JEDES MAHL EIN GENUSS (Each Meal a Pleasure), which is in Austrian. The book is not available in English, so with the help of my husband, we've translated the recipe and adapted it to the American kitchen. Chef Bacher's technique for cooking the fish is very unusual. You can use the same technique for any fish recipe. Put it in your repertoire! You can use trout or salmon filets for this recipe. If you use salmon filets, be sure to choose ones that are thin. This is a recipe to do when you have a lot of time. The techniques are not complicated, but cooking fennel five ways is time-consuming. You could abbreviate the recipe by eliminating one or two of the fennel variations, but the dish won't have the overall charm that Chef Bacher intended. With 2 fennel bulbs, cut away the tough outer layer and discard. Carefully remove the next two layers from the outside of each bulb so you have 4 leaves that look like scoops. Cut the bottom of each "scoop" as shown in the picture so that it will stand up on its own and looks like the prow of a boat. Cook the "scoops" gently in salted water and lemon juice until tender. Remove from the water and set aside. Cut the inner part of the first bulb into very thin slices, using a mandolin, and marinate with a few TBS lemon juice, olive oil, salt and pepper. 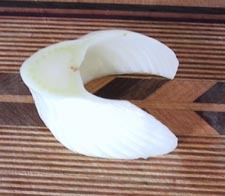 Cut the inner part of the second bulb into very thin slices, using a mandolin, and marinate in olive oil, salt and pepper. After discarding the tough outer layer, cut the third bulb lengthwise in 5 mm-thick slices. You should have at least 4- 6 slices. Dust each slice lightly with flour and draw through tempura batter (follow instructions on the box on how to make the tempura batter). Fry the slices at moderate heat floating in peanut oil. Drain on paper towels and keep warm. Cut the fourth bulb into small dice after discarding the tough outer layer. In a saucepan, sweat the dice in melted butter and splash with Pernod. Add the beef bouillon and cook until "al dente". Slowly stir in the butter and add the finely chopped fennel tops. While the fish is resting, fry the skin in hot peanut oil until crispy. Place the cooked fennel "scoops" on a dinner plate and fill with mashed potatoes. Garnish with finely chopped fennel tops. Pour a about 1/3 cup of ragout on each plate and place the fish filet on it. Cover the fish with the crispy skin. Garnish each plate with one or two fried fennel slices and the two types of marinated fennel. Serve any remaining ragout in a small pitcher.